We like to eat. And I say why not. Food is the fuel that powers our bodies and minds. It provides us with life-sustaining nourishment that keeps our incredible machines running. But eating typically becomes more about the enjoyment of smells, tastes and textures than the nurturing of our bodily systems. Therefore, we gain weight from the added calories, and the older we are, the more we gain thanks to a slower body metabolism. A study by The Journal of the American Medical Association showed that in the years 2007 and 2008, 68 percent of Americans were either overweight or obese. Cutting back on food portions and sweets are steps in the right direction, as this reduces caloric intake, but the recommendation from our doctors inevitably includes the scary word "exercise." We all know it is extremely important, and yet we tend to avoid such effort especially as we start to slow down the pace of life in middle age. Boring can literally be defined as an activity associated with lifting weights or doing resistance activities, running around the neighborhood even though we have a car, or using a treadmill and/or elliptical device to get nowhere. Exercise, for the sake of exercise, does not supply enough distraction to redirect our minds from the pain and suffering we endure (thank goodness for iPods) in the interest of better health. Did you ever see a smiling runner? How much joy is on the face of someone lifting weights? Did you ever reach your destination while spinning at the gym? I think you get my point. Therefore, I want to share some interesting and important information with you that might just be the answer to this dilemma. Recently I received a downloadable copy of the PTR (Professional Tennis Registry) publication entitled, "Practical On-court Applications for Sport Science." While I won't go into the details of how players can train for optimal fitness and athletic success, I would like to point out some details they cited from the 2009 Strength and Conditioning Journal. According to their studies, a typical hard-court rally (hard courts are what you generally find at your local park) lasts between 4 to 6 seconds with players changing directions 3 to 6 times during the rally. Most of the movement was found to be lateral (side-to-side) along the baseline (back of the court) with 80 percent of the movement between strokes being 8 feet or less. When played for points, a tennis match is very stop-and-go leading one to believe that aerobic benefits cannot be derived from this activity. However, thanks to the necessary recovery time between points where one may find themselves filling their lungs to capacity, aerobic capability is developed. I know that I've participated in my fair share of this on-court puppetry thanks to a hitting partner who loves to draw me into the net with a short ball and then lob over my head. Now let's talk heart rate. During a match, beats can reach 190 per minute while lowering to 110 between games. Even with this drop, however, the body continues to be keyed-up while in the midst of performing both psychological and physical functions. In other words, tennis is working the mind as well as the body both during and after performances. As a matter of fact, this study suggests that a typical player might burn anywhere from 300 to 2,000 calories during a match with the numbers varying based upon the quality and length of rallies, levels of skill both at the baseline and net, age, gender, and body weight. The caloric intake of the average adult male is 2,507 calories per day. Adult women fall into a lower range of 1,766 calories. Both statistics are the result of a 2007-08 survey known as NHANES, or the National Health and Nutrition Examination Survey. But the best part is this: Tennis is fun! Yes, it can be challenging. Yes, it makes you sweat. And, yes, it does require effort on your part to in order to play. Even so, running around hitting balls, especially the slower, easier-to-hit ones commonplace in the QuickStart tennis programs, provides loads of enjoyment, inexpensive entertainment, and apparently good health as well. So let's eat. Why not, I say. 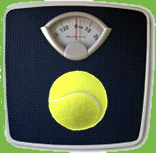 Just watch your portions and let the lifetime sport of tennis take care of a generous slice of your caloric intake. Do it for the health of it!